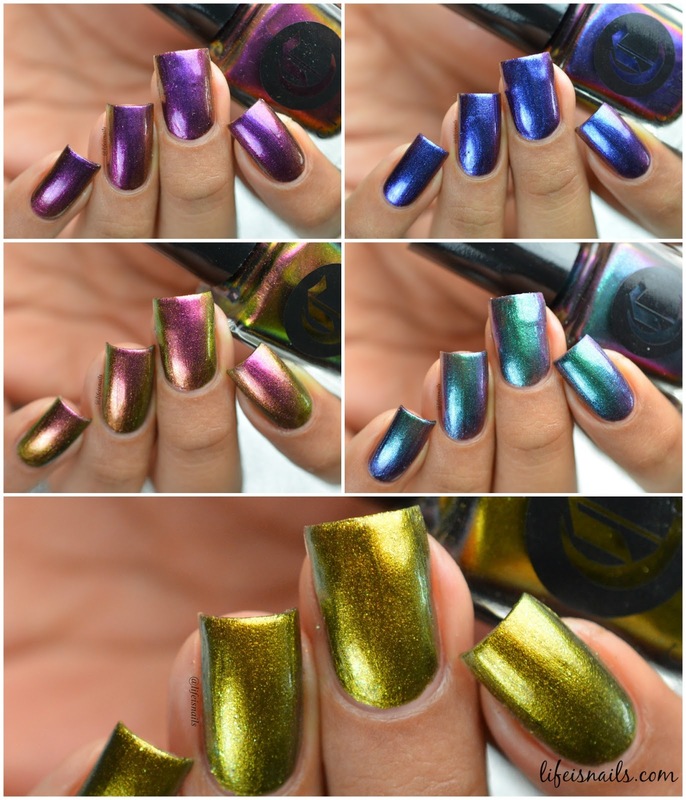 Today I have swatches of Cirque Color's The Meta Collection to share with you! When Annie, the creative mind behind this beauty brand asked me if I would like to swatch her upcoming collection, I was beyond excited and honoured because her brand is popular for perfection in every kind of lacquer finishes. I was afraid if I will be able to do justice with her stunning polishes. This limited edition release includes five futuristic shade-shifters that leave a shimmery, brushstroke-free finish. These multichromes are unique and different from other multichromes in the market, these have beautiful shimmery flakes in them which give these a metallic finish. So lets cut off my talking and proceed to the swatches! Cabaret Voltaire - A gorgeous multichrome which shifts from purple to pink to orange and gold with micro shimmery flakes in it. Shown here is 2 thin coats plus top coat. Some Great Reward - A beautiful multichrome which shifts from gold to green with micro shimmery flakes in it. This looks so luxuriously unique and rich, I absolutely love it. Shown here is 2 thin coats plus top coat. Version Infinity -A lovely multichrome which shifts from blue to purple to red/pink with micro shimmery flakes in it. Totally unique and new multichrome for me. Shown here is 2 thin coats plus top coat. Techno Manifesto - A splendid multichrome which shifts from Fuschia pink to orange to yellow and green with micro shimmery flakes in it. The shift in it is common for multichromes out there but the finish is not so totally a must have. Shown here is 2 thin coats plus top coat. Ghost In The Machine - A marvelous multichrome which shifts from green to blue and purple with micro shimmery flakes in it. Again a unique and a great combination of color shift. Shown here is 2 thin coats plus top coat. Overall I loved this entire collection because of many reasons be it the buttery formula fully opaque in 2 coats or the shimmery finish in them which is totally unique as compared to the other multichromes in the market or the great combination of shifts. Too many reasons to love this collection right! If I had to select any one as my favorite, it will definitely be Some Great Reward, it's so rich and classy!